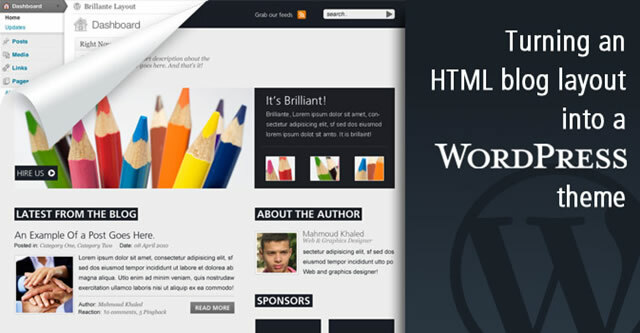 In this tutorial, I’ll teach you how to adapt a simple HTML blog layout into a WordPress theme. We’ll be using this static page as starting point. The Brilliante Layout project source code for this theme is available on Github, including the dummy content for posts, pages and such. We won’t start from scratch, we’re building it using our static version base. I suggest you to follow along snippet by snippet, but,	if you happen to be as lazy as me, the data folder will help you getting up and running with the content data, it also includes instructions in case you don’t know how to import it to your fresh WordPress installation. 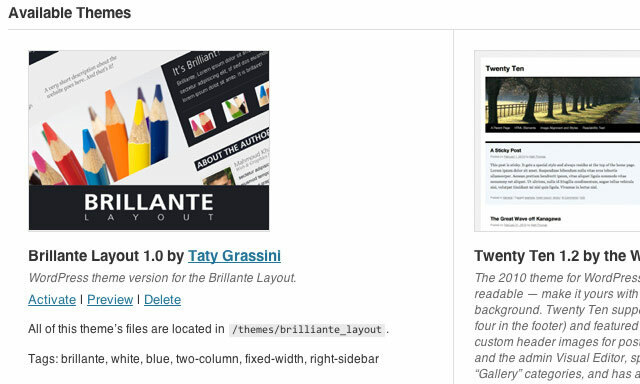 We could kick out a simple theme by just serving an index.php and a style.css, but we’ll need more than that to give Brilliante Layout all the WordPress shine we can. 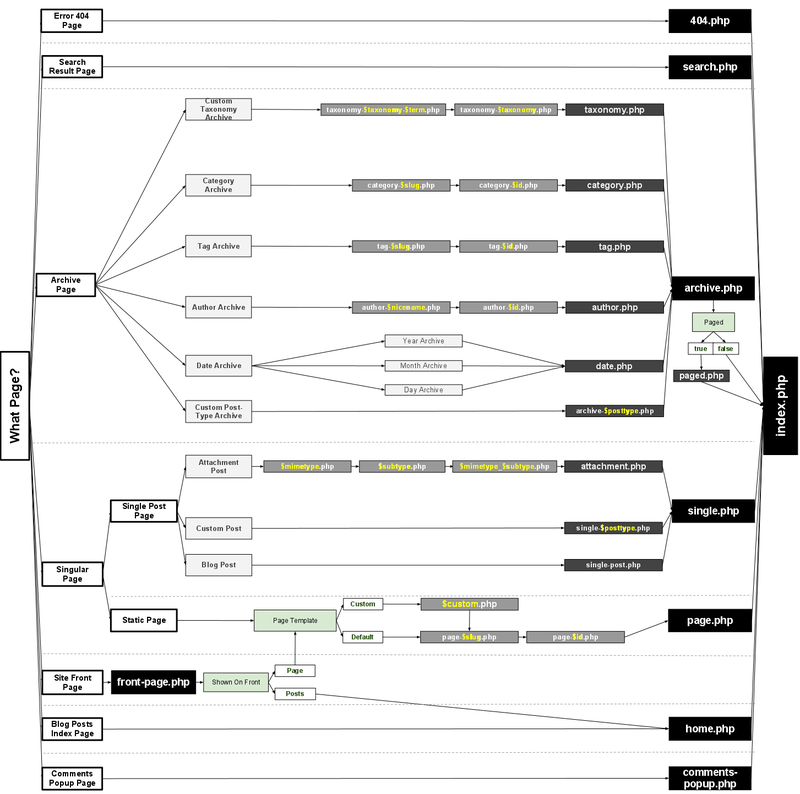 There’s a good graphic you should check to understand the template hierarchy. 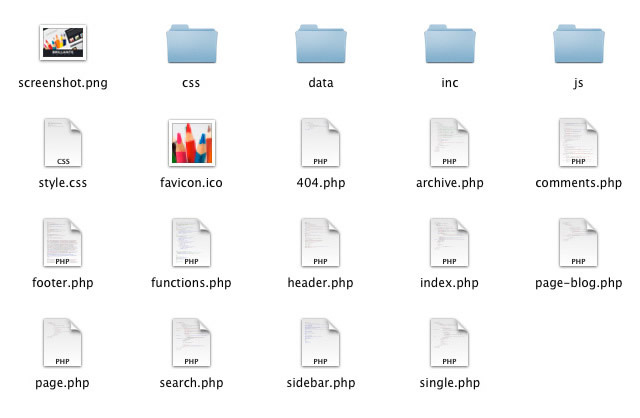 When developing a theme, we are basically choping up HTML code into PHP files. Here’s this awesome article explaining every single theme file in a ridiculously simple way. It’s always a good idea to have an open tab with the Codex: yes, there’s no better place than that to learn or find documentation almost about anything WordPress-related. I’ll be linking to the Codex frequently all along this tutorial. 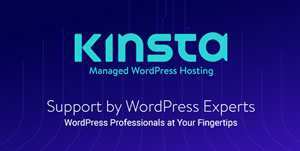 Description: WordPress theme version for the Brillante Layout. For better performance, we won’t use the @import statement here to call our styles. We’ll use the style file to render the theme info only. See the bloginfo function all over the place. It’s one of the most useful functions in theme development. Highlighted lines show you some of its common parameters, such as site name, RSS, main URL, description and template URL. See line 9: instead of using the bloginfo('stylesheet_url') function, we’re using the bloginfo('template_url')?>/css/style.css, telling the CMS to go straight to our css folder. Line 20: if it’s a single view or a page, assign the single class to the <body>	element, so we can manipulate different styles with CSS. Then, the usual stuff: navigation and the search form. Sidebar is widgetized as well. Same deal as before with the else statement: unless one or more widgets assigned, render author, categories and log-in box. Index ties everything up. 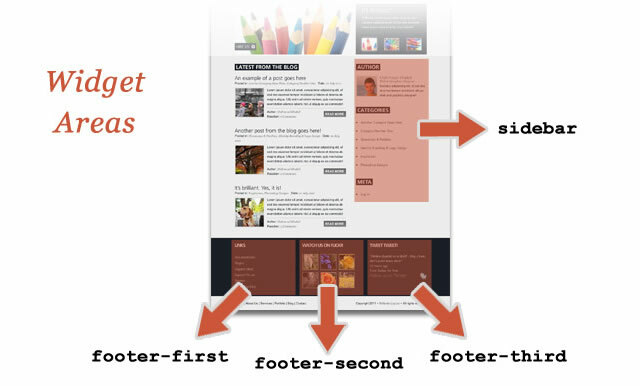 The get_header, get_sidebar and get_footer are pretty self-explanatory. From the top, we include the featured area slideshow snippet from the inc folder, only used in the home page, then the loop on line 10, the post snippet on line 12 and the navigation snippet included on line 22. // Get our wp_nav_menu() fallback, wp_page_menu(), to show a home link. This huge amount of code has comments, giving us a hint of what these snippets do. This will take care of our menues, widgetized areas, post featured images, meta tags cleaning and the chance to get rid of the admin bar (in the case you hate it). We’ll also need a single view for our posts, pages, archives, search results page and a page template for our blog link. At the top, there’s no need for the featured area slideshow on the single view. Line 14: we’ll render the featured post image for the single view, bigger image, its dimensions have been declared in the functions file. The code on the first half will give us a heading with the proper condition for our query. A list of search results containing the_search_query. The code comment in the first line is a WordPress convention for custom page templates. You need to declare a template name which will show in your dashboard when creating a new page or editing an existing one. Repetition in theme development can be spot quite often if you’re not careful. Most of the times, the post code will repeat on the index, single, archive and search files. Dan Harper made an awesome screencast some time ago, applying the DRY programming technique into a WordPress theme, using includes as we did with the post, navigation and featured area. 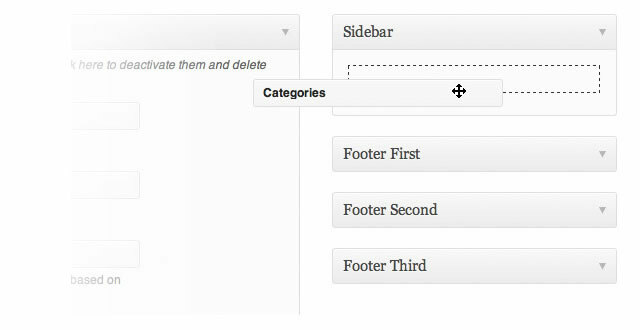 But, luckily for us, since version 3.0, WordPress is shipping with the get_template_part function to achieve just that. Any of these two techniques will do, it’s up to you: the WordPress way or the Rails DRY way. I’m not showing the final CSS file here because of its length. 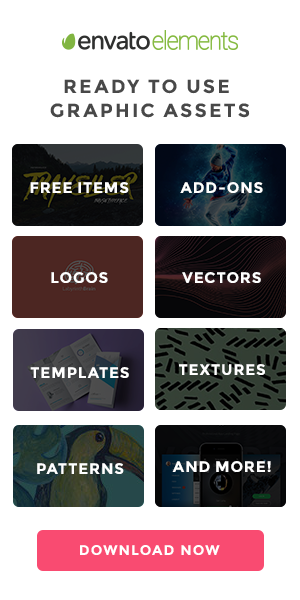 Yep, our CSS has grown exponentially and has been changed with new WordPress classes and ID’s. You have to think ahead to the future of our theme users need. 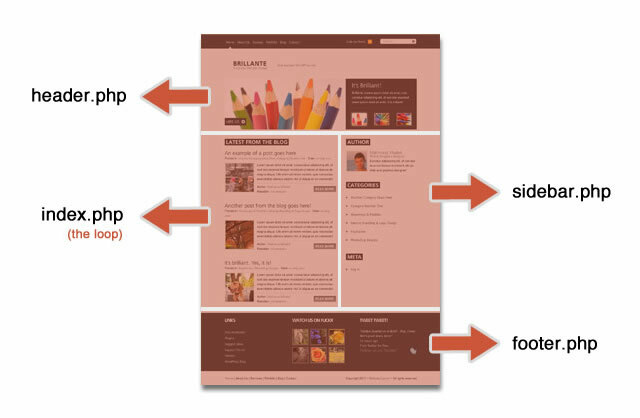 They will surely drop a widget on your sidebar or footer and your CSS has to be ready. Sometimes users are HTML-savvy and they will write that rare tag you never thought of and BUM!, your design fails. Go ahead and download the official WP-theme unit test. It has HTML elements and all sort of crazy stuff to style before hand. Once again, download the Brilliante Layout theme and take it for a ride. Feel free to use and abuse. Thanks a lot for the reading, guys! Bye.